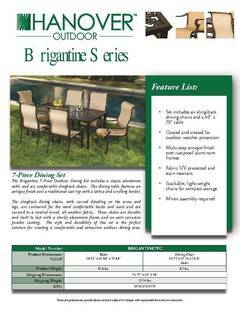 The Hanover Brigantine 7-Piece Outdoor Dining Set makes a lovely centerpiece where your family and friends can gather to enjoy meals and unwind from long days at school, day camp or work. This attractive unit is designed to mix contemporary lines with a classic style while blending in with all types of exterior decor. The sleek, rectangular table is crafted with a lattice pattern that introduces a touch of elegance to your outdoor space. Six stackable chairs come complete with an anti-corrosion Interpon powder coating and durable, rust-resistant aluminum to ensure they hold up year after year. These eco-friendly chairs include a PVC sling fabric that is UV resistant and dries off quickly after exposure to rain. They are also light enough to move around with ease as needed. This comfortable outdoor patio dining set makes a lovely addition to your terrace, garden or patio, and it provides a relaxed seating arrangement for leisurely entertaining. 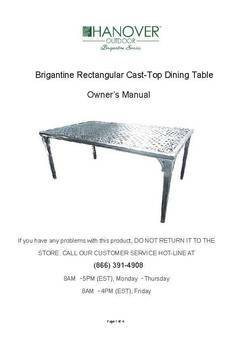 The Hanover Brigantine 7-Piece Outdoor Dining Set makes a lovely centerpiece where your family and friends can gather to enjoy meals and unwind from long days at school, day camp or work. This attractive unit is designed to mix contemporary lines with a classic style while blending in with all types of exterior decor. The sleek, rectangular table is crafted with a lattice pattern that introduces a touch of elegance to your outdoor space. Six stackable chairs come complete with an anti-corrosion Interpon powder coating and durable, rust-resistant aluminum to ensure they hold up year after year. These eco-friendly chairs include a PVC sling fabric that is UV resistant and dries off quickly after exposure to rain. They are also light enough to move around with ease as needed. This comfortable outdoor patio dining set makes a lovely addition to your terrace, garden or patio, and it provides a relaxed seating arrangement for leisurely entertaining. Add this 7-piece patio dining set to your home and enjoy the beauty and functionality that it has to offer. The table and chairs can also be used indoors for an added touch of versatility. This set is the perfect replacement for our glass-topped patio set which was destroyed in the most recent high wind rain storm. Since the table is not solid, the wind goes through without moving it out of place. Chairs are good looking and sturdy too. The fact that they are stackable is a plus. it took more time to remove the protective wrapping off of the chairs than it did to put the legs on the table. ha! very easy. i was concerned, buying online, about the texture of the table top, but its just fine. plenty stable. I love this patio set! It's lightweight and very easy to store. It was assembled for free by the people that delivered my patio set! It's well made and is a very affordable price! Aluminum sets sell for 3x-5x this much in retail stores. I am very happy with this 7-pc. dining set. Table corners were not sharp, as some reviews had mentioned. There were two minor dents in table edge, otherwise good condition and quality. Chairs are very comfortable. We live in the Midwest, so deal with all the elements. Will probably stack the chairs and place in a protected corner of the patio when strong winds are predicted, as they are lightweight. Table legs were fairly easy to install and table is sturdy and stable. All pieces seem aligned well and do not wobble. Found the same set on another website first, but the set was less expensive on the Walmart website. Also chose ship to store option and saved $90+ in shipping charges, so appreciated that option. It arrived prior to predicted date as well. We have had rain showers and thunderstorms and there has been no rusting that I can detect. I'm hoping to get many years of good use from this dining set!